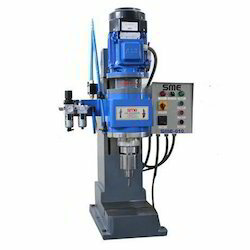 We are counted as one of the renowned manufacturers and suppliers of an extensive range of Orbital Riveting Machine. 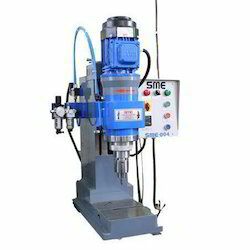 The offered range includes Spin Riveting Machine, Orbital Riveting Machine, Both End Riveting Machine and Multi Spindle Head Riveting Machine. Our products are manufactured as per the defined industry standards using high quality raw materials and advanced technology. These are widely appreciated by the customers for features like high efficiency, optimum performance and sturdy construction. Our clients can avail from us, a wide range of Orbital Riveting Machine that are manufactured using quality raw material procured from the reliable vendors. Our range of orbital riveting machine is capable of an orbital forming function that is a cold forming process. This process can be used to head swage, crown, flare or draw a column or projection of malleable material. Moreover, this process can also be utilized in fastening and assembly to manufacture a high quality head form- to rivet without interruption of component material grain structure. We are reckoned as one of the prominent companies, specialized in manufacturing and supplying a qualitative range of Pneumatic Orbital Riveting Machine. Designed after extensive research, these are efficient in delivering cold forming process by offering orbital forming functions that are required for moulding metallic substance into a regular shape. In addition, these can also be used with crown, head swage, flare or projection, assembly, fastening and others, without interruptions from the component material grain structure. We S. M. Engineers, are one of the leading manufacturer, trader and suppliers. 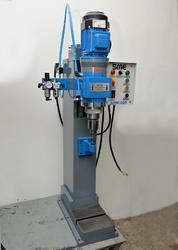 We hold expertise in manufacturing and supplying a wide assortment of Industrial Riveting Machines. Our offered range includes Spin Riveting Machines, Orbital Riveting Machines, Both End Riveting Machines. These are manufactured according to the defined industry standards, using the premium quality raw materials and advanced technology. Our highly qualified professionals manufacture these as per the defined industry standards, using advanced technology and high quality raw materials. In addition, our customers highly acknowledge these machines for attributes like durable finish, reliable performance, robust construction and longer service life. In order to meet the specific requirements of our customers, we have set up a well equipped manufacturing unit. The entire unit is installed with all the relevant amenities and advanced hi-tech equipment for the production of flawless Industrial Riveting Machines. We always endeavour to offer superior quality products. Never compromising on the quality, we supply best quality products in accordance with the international standards. Based on the feedback of our customers, we are constantly innovating our products. We also have a separate designing unit, which is equipped with CAD 2D 3D software and other designing tools.